As soon as I read this recipe for Tortilla Chicken Legs in Gourmet magazine, I knew two things 1) easy dinner and 2) kid-friendly and I mean big kid friendly! We never have a bag of chips in the house unless it is here for a purpose; company coming and we are serving salsa, even then, I usually bake our own tortilla chips for this dish I picked up a big bag with the intentions of dinner and have some guilty pleasure laying around the house. This recipe is so easy and it is so tasty, not overly spicy, just right and the texture is great. Crunchy on the outside and moist and juicy on the inside. Your kids, young and old, will love it! Ree, The Pioneer Woman, sent out a Twitter this week asking anyone to jump on board, for making something with leftover corn. I have never really been a big corn fan, I blame it on wearing braces as a kid. Lenny, discovered white corn a few years ago, on a trip back from climbing in Yosemite and he loved that you could just gnaw it raw off of the cob, not overcooked corn that he remembered as a kid. I, too, have discovered the sweet and succulent White Corn and now, I love it as well. We eat it very often in the summer months – raw, grilled and steamed with butter. Anyhow, we have had 3 ears of white corn in the fridge and this was the perfect reason to do something with it. 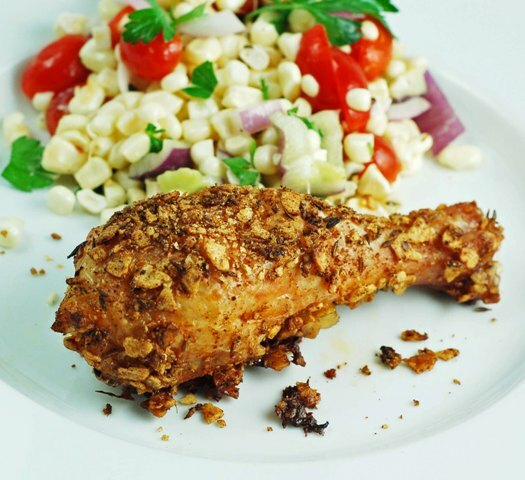 We wanted something refreshing to compliment the spiciness of the drumsticks, so we made a white corn salad. It is very simple and you can really use whatever you have on hand. We tossed in purple peppers, cherry tomatoes, parsley, red onion, and the sweet white corn. Dressed up with simple olive oil and fresh lime juice – perfect summer salad! Thanks, Ree, for putting a little fire under us! Oil a large 4-sided sheet pan. Pulse chips, cumin and paprika in a food processor until coarsely ground, then transfer to a shallow dish. Dip chicken legs in egg, letting excess drip off, then coat with crumbs, pressing to help them adhere. Transfer to a sheet pan. Bake, turning once until cooked through, 40 to 45 minutes. Let stand, uncovered, 5 minutes. 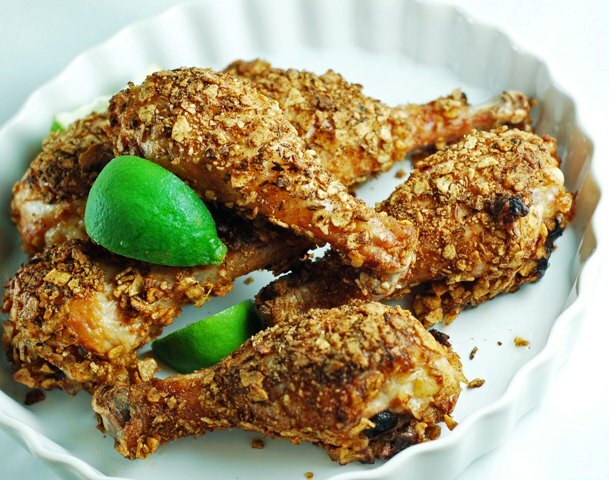 5 Responses to "Tortilla Chicken Legs"
Perfect dinner for a picnic or backyard dinner. My son always makes this corn salad and when he does, I can't stop eating it. Ah, now I know what to make with the broken tortilla chips too small for scooping. All looks delish! Lovely!!! the good-quality chicken must make all the difference in a simple recipe like this! Tortilla chips... what a great way to add some personality and crunch! I'm planning on trying the chicken and salad this weekend for company.Looks so good. Yum Yum! I'm drooling already for some chicken and tortilla salad. Looks absolutely delicious.